If you want to make delicious, nutritious, and Instagram-worthy food at home, you need the right equipment. Apparently, a good pan or more than one is essential to ensure you cook your meals to perfection. Not only are they the perfect nonstick go-to, but they also sear food well, are oven safe, and are light enough to toss ingredients around (Source). 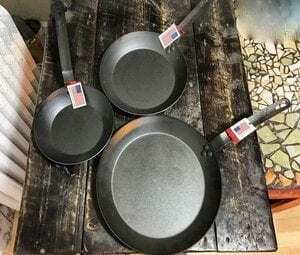 Carbon steel pans are becoming an increasingly popular choice for cooks everywhere because these pans combine the advantages of a cast iron pan with significant savings in weight. Furthermore, carbon steel pans more closely resemble the appearance of vintage or old cast iron pans of years gone by. Like cast iron, a good carbon steel pan can last for a lifetime when properly taken care of. Hence, it will also be a great addition to your cookware collection. This pan gets high marks for versatility. In fact, you can use it for roasting, frying, sauteing, and simmering. However, it is best when used for searing both meat and vegetables. On the other hand, weighing four pounds and at 12 inches in diameter, this pan is large enough for almost any meal. Its all-metal handle means it can be used inside the oven, too, while the pan itself could fit inside most ovens. Moreover, a nice feature of this pan is that it comes pre-seasoned because not everyone has the time to season their pans. Hence, with the Lodge CRS12, you can get cooking right away. Surprisingly, it comes pre-seasoned with soybean oil which makes it vegetarian-friendly as well. However, with repeated use and washing, this coating will start to wear off, and more seasoning will probably have to be performed by the customer. On the contrary, this pan can be used practically everywhere except in the microwave. Of course, carbon steel pans cannot be used in a microwave. So, this pan is about as versatile as they come. Safe to use metal objects in the pan. Extremely versatile for many different cooking tasks. Large size makes it possible to cook large meals. The metal handle gets hot during use, so keep an oven glove handy. Additional seasoning will be required once the factory coating wears off. The extra thick steel of this Mauviel pan is designed to stand up to intense heat which makes it suitable for a range of cooking tasks. It’s especially good for searing meat such as steak or fish since the metal surface of the pan will reach a very high heat if you let it. Made in France, this pan carries a lifetime warranty for regular household use; it’s certainly a sturdy piece of equipment for any kitchen. The durable construction means it can be used on any cooking surface, too, whether gas, ceramic, electric, or the backyard grill. However, thicker than usual steel does have its downsides. This pan can be slower to reach cooking temperature than others. On the plus side, it will hold that heat for longer, too. It is recommended to season the pan before using; you need to do this right away. The Mauviel has an unfortunate propensity to rust if it isn’t maintained with light oiling immediately. As a result, this scenario might explain the manufacturer’s decision to pack the pan by covering it in protective beeswax which you will need to remove. Overall, at only 2 pounds, this is a lightweight pan that anyone can use. Its small size does make it better suited for smaller families. You probably won’t be scrambling eggs for twenty people in this pan, but it will do a great job of searing a couple of steaks just the way you like them. As soon as you pick up this pan, you’ll get a sense of its solid construction. A good quality carbon steel pan should last a lifetime, and the Matfer feels like something your grandchildren may one day use to cook food with. That kind of substantiality has its downside, of course. At around four pounds, this skillet is not lightweight. But given the almost 12-inch diameter of this large pan, you would expect it to weigh a little more than others. Notably, this hard-wearing pan is usable on any heat source, including induction stoves – anything except the microwave. However, it comes unseasoned; before you begin to use it, you will need to season this pan and make it non-stick. Be aware, too, that this pan should be heated gradually before use because the metal can warp if exposed to very high heat without any warning. Like many carbon steel pans, this skillet can be used on any type of hob, including induction ovens. It has an oven-safe and all-steel riveted handle labeled as unbreakable by the manufacturers. Just be aware that a metal handle will get hot during cooking, and you’ll need to protect your hands before grabbing it. De Buyer is a French brand with 180 years of history, so it’s somewhat surprising to find that this pan only carries a two-year warranty. Fortunately, it is a solidly constructed and thick steel pan that will not warp under heat. However, it requires seasoning before use. On the other hand, once seasoned, you will have a non-stick surface that’s better than Teflon. Additionally, the heat distribution of this pan is as good as that of a cast iron pan. Hence, this ensures food is heated more evenly for better cooking. On the contrary, all this solid steel comes at the price of significant weight. At a whopping 4.6 pounds, this is one of the heaviest pans out there. On the plus side, the 11-inch diameter makes it great for scrambling eggs or preparing other meals that benefit from a little extra space. With its cross-hatched pattern, the Mineral B is an interesting-looking pan that is unlike other carbon steel pans. This diagonal pattern is purported to increase the pan’s non-stick properties. Don’t think that means you don’t have to season this pan before use, though, because you will. However, notably, despite the generous 11-inch size, this pan weighs a mere 3.5 pounds. Hence, it is usable on all stovetops, including induction; the metal handle will easily survive use in the oven, too. As is often the case with pans from French manufacturers, the Mineral B comes with a protective beeswax coating that will need to be washed off with boiling water before you begin seasoning. On the plus side, it comes with instructions on the seasoning process that must be followed before use. Make sure you do this as soon as you can; this pan is liable to develop rust very quickly. Thus, the sooner you season it, the better. Go to any kitchen or home store today, and you’ll find a dizzying array of different pots and pans, ranging from suspiciously cheap to ridiculously expensive. Online, it gets even trickier. It’s hard to cut through the sales peak and find the right pan for you. This is where our guide comes in to help. It’s an obvious point, but you need to choose a pan that’s within your budget. Selecting the cheapest pan available is a sure way to get something that either won’t last or won’t cook your food properly. There’s no sense spending money on great ingredients, only to ruin your cooking with a substandard pan. On the other hand, you don’t need to spend a fortune to get a decent carbon steel pan. If you only cook now and then, you can probably get away with something more affordable. But if cooking is a significant hobby, think about the long-term value of a better pan. If correctly cared for, a carbon steel pan should last you a lifetime. But not all pans are created equal. Make sure that what you’re buying is going to last long. Online customer reviews can be a great source of information. Just like cast iron, seasoning the carbon steel pans is necessary before use. 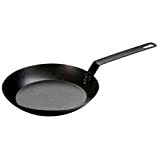 Regular heating of the pan with oil inside will lead to the creation of non-stick polymers on the steel. If you prefer to know everything that goes into your food or if you like to do things the old-fashioned way, seasoning the pan yourself allows you to make it your own. However, if this isn’t something you’re willing to do, you can opt for a pre-seasoned pan. This aspect is an important one, and it requires you to think about your cooking style. A lighter pan means less strain on your arms. The sloped sides of carbon steel pans make them ideal for sauteing, but if you’re tossing food into the air, you want a pan you can comfortably lift. Naturally, the size of a pan will affect its weight. The size of pan you need will depend on what you intend to cook, and for how many people. Someone with a big family or who does a lot of entertaining is going to need a bigger pan than someone who usually cooks for themselves or one other person. Q: Are carbon steel pans safe? Yes, they are safe; their only components are carbon and iron. They don’t have dangerous non-stick coatings, too. Q: How do you cook with carbon steel pans? You cook with it normally; after you season it in preparation for its first use, of course. Q: How do you season carbon pans? First, wash the pan. Then, dry it. Second, set the pan on low heat. Third, pour 1/3 cup of oil, 2/3 cup of salt, and peeled skin of two potatoes. For 10 minutes, move things around as it heats. After that, remove the potato peels alongside the excess oil particles. You can also heat you pan by heating your oven to 400F for 10 minutes with your pan in it. Q: How do you re-season a carbon steel pan? First, soak it in warm water. Second, scrub it with a sponge or dishcloth. Third, ensure that the pan is dry. Lastly, lightly spread oil over the pan’s inside and outside using a paper towel or cloth. 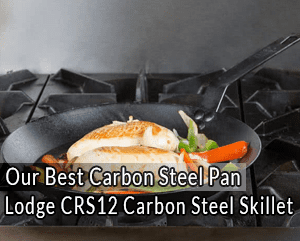 Before you decide on what carbon steel pan to buy, you need to think carefully about how and when you’ll be using this versatile piece of cookware. You also need to take note of how many people you intend to feed, and what kind of cooking you’ll be doing. We’ve given you our advice; it’s your turn now. Take the time to do your research, and you’ll end up with a pan that will last forever and take your cooking to a new level. 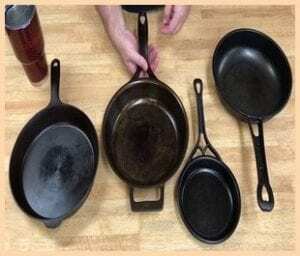 If you’re a fan of carbon steel, or you’ve tried any of the pans listed above, jump to the comment section to let us know!